Despite the catastrophes of March 11, I finished my new book at the end of July. It was published finally on 31 of September. The title of the book is If: The Titans Who Changed The World. 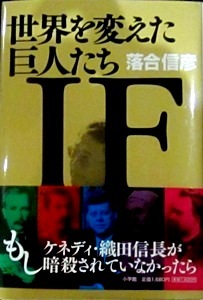 Like all my other books, it’s in Japanese. It has imaginary dialogues with ten giants who changed the world, and considers alternate histories. For example, what would have happened if JFK was not assassinated in ’63, or what would have been the fate of the Roman Empire if Julius Caesar had not been killed. It’s a historical entertainment and looks at the many “IFs”in history. This entry was posted in Books and tagged Nobi Ochiai, Nobuhiko Ochiai. Bookmark the permalink. Why doesn’t Ochiai publish a book in English for once?